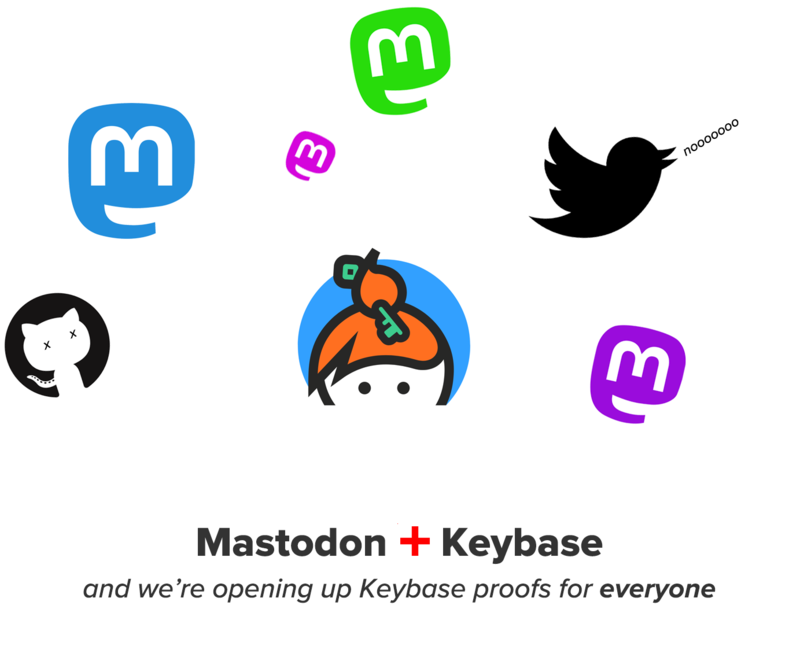 Today we're announcing that Keybase has a new, open proof protocol, and we've kicked it off with the Mastodon Fediverse . Already, 31 communities are live ( mastodon.social , witches.live , aus.social , etc. ), with many more in the coming days. If you're on an instance called cereal.eaters and I'm on an instance called milk-providers.org , we can follow each other and see each other's "toots" across the network. Censorship rules are up to the instances. This is federation at its finest. posting is brittle ; Twitter may not link to a screen with the tweet pre-filled. Also Harald may edit the tweet and mess it up. Twitter will still let him post it, but it will be nonsense. people can post false claims on Twitter ; Keybase wouldn't understand or honor them, but a tweet that's a lie might confuse Twitter users. every site is different ; Keybase needs to understand how to look up tweets, parse them, confirm the author, distinguish usernames, etc. 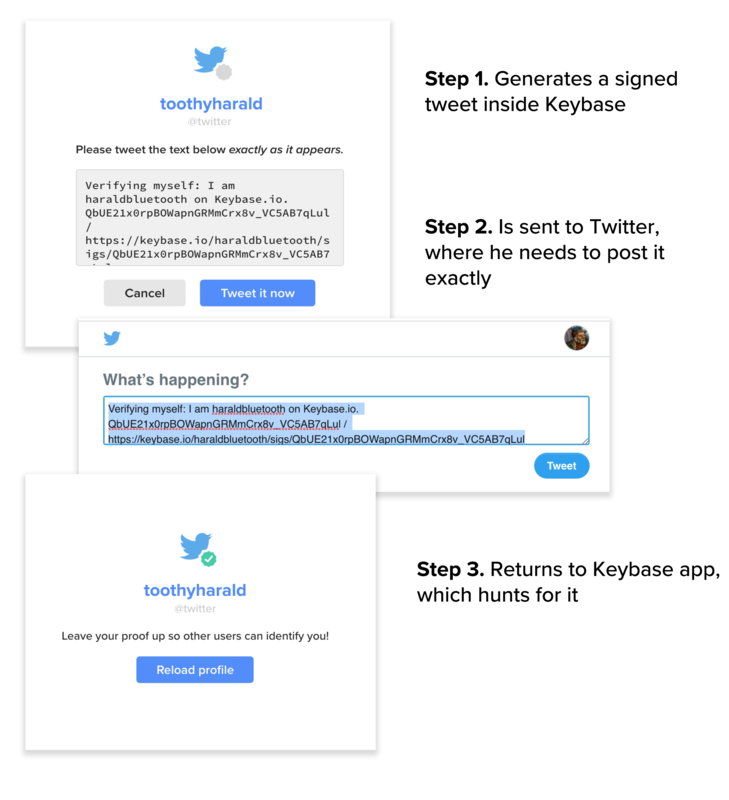 It would be easier if Twitter could tell Keybase apps how it works and how to look up a proof. 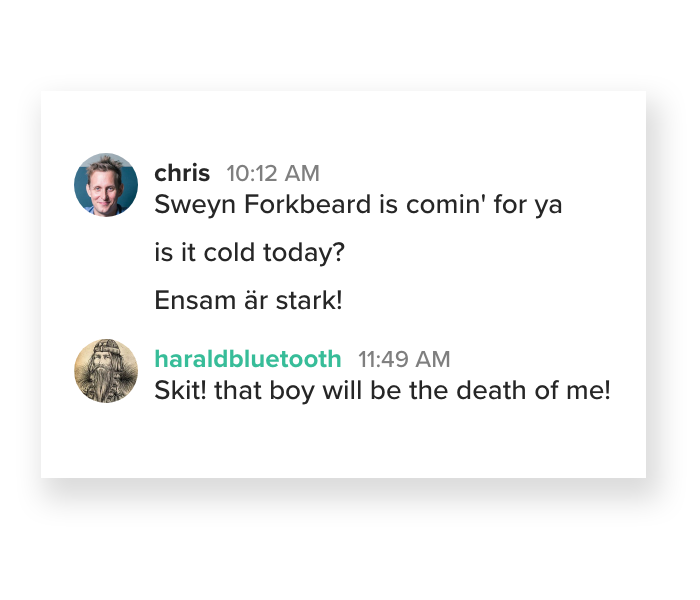 the tweets flow into history ; how can someone start on Harald's Twitter profile and know his Keybase username? 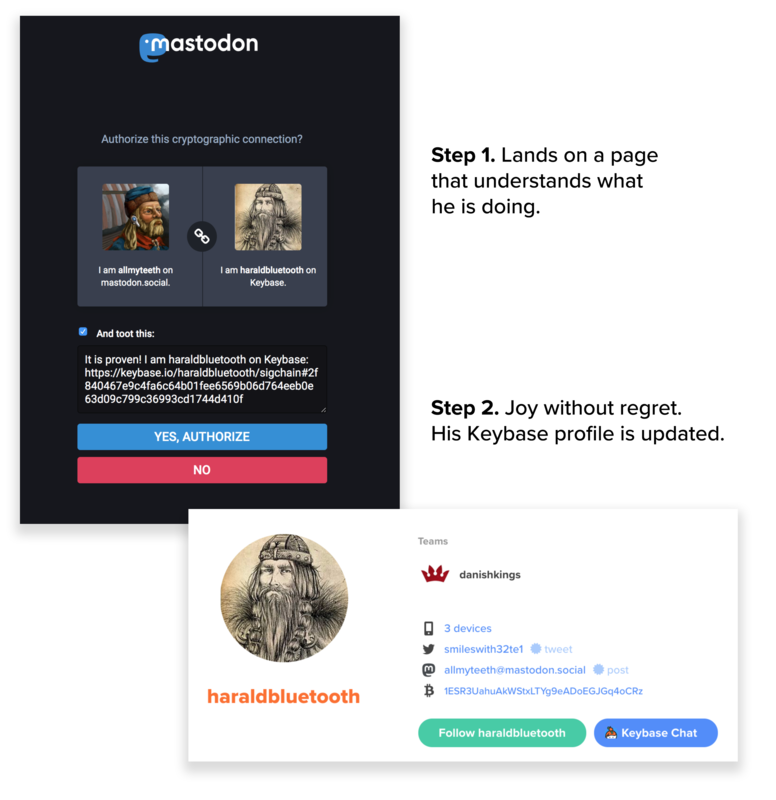 Mastodon has done all this right, starting in Mastodon version 2.8 . And nowanyone else can, too. It wasn't a large project. They had to create or update a couple JSON endpoints, a config file, and an extra screen to handle this proof connection.Any site can do it. Here's our integration guide . It's still a bit rough around the edges, but it should only take a day or two of programming to get your side done. Perhaps. If not, reach out toxgess. 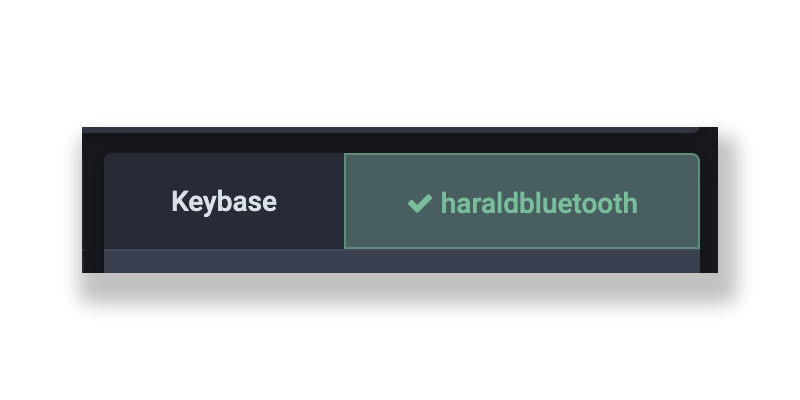 We would love to connect Keybase to any forum and messageboard software , GitLab , NPM , Ruby Gems , other code publishers, and even LinkedIn . Over the years, people have asked us for various integrations in this ticket . If you know anyone on any of those teams, it's now in their hands...we'll be standing by to help out. Please let us know . We can expand and improve this. We're toying with an idea of auto-creating teams based on these integrations. If you run sitex.org , then your connected users could also automatically end up in teamx on Keybase, in channels of your choice, for encrypted chat and file sharing. If you run a larger community or site and are interested in talking about this feature, reach out tochris on Keybase. We could prioritize it.